The first two Advanced Generation movies did not have an opening theme play during the opening credits, but the third movie, Myuu and the Wave-Guiding Hero, does. 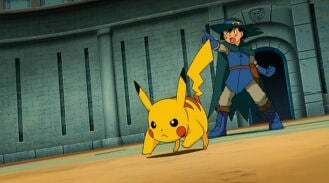 The song used, Battle Frontier, is a remix of the series' fourth opening theme. Kanzen, nenshou YES, I'm OK!! Kanzen, muketsu da Are you OK?